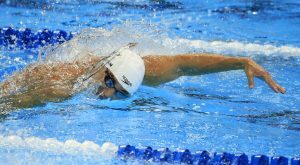 Nathan Adrian swims in the men’s 100-meter freestyle preliminaries at the U.S. Olympic swimming trials, Wednesday in Omaha, Neb. 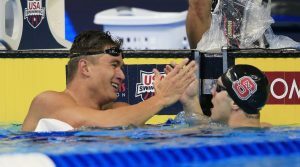 It was business as usual for Bremerton’s Nathan Adrian as he posted the fastest qualifying time from Wednesday’s heats and will swim in the semifinals of the 100-meter freestyle at the U.S. Olympic Swimming trials in Omaha, Nebraska. Nathan’s time of 48.43 seconds was just off his personal best this year of 48.00. Nathan has been the fastest sprinter in the country and looks to qualify for his third Olympic team and defend his 100 free gold medal he won in London in 2012. North Carolina State’s Ryan Held was the second fastest at 48.46. The semifinals are live at 5 p.m. on NBCOlympics.com and also on the NBCSportsExtra live app for your smartphone. Or, you can watch the tape delay on NBC at 8 p.m.